Crispy, Cheesy, Crunchy No-Carb Taco Tuesday! Home recipes Crispy, Cheesy, Crunchy No-Carb Taco Tuesday! If you follow me on Instagram or know my family well at all, you know we would eat Mexican food 7-days a week if we could! This recipe is perfect for anyone looking for a low-carb or weight-loss friendly option for taco night! Who doesn’t love a quick and simple recipe? This is fast, easy, and family friendly! 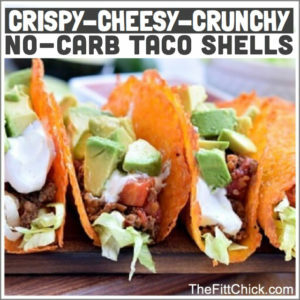 TheFittChick NO-Carb Cheesy Taco Shells! 2. Line a cookie sheet with parchment paper or a baking mat. 3. Sprinkle cheese in the shape of a circle to your desired size. I use about ½ cup per taco shell. 4. Cook for 6-8 minutes until the shells start turning brown. 5. Remove from the oven and using paper towels (so you don’t burn your fingers), quickly and gently bend each shell over the edge of a large mixing bowl or in a taco stand. You can also put it in a bowl to make a taco salad bowl! 6. Allow to sit and set for five minutes. 1. Line a microwave-safe plate with parchment paper, and make a circle of cheese. I generally use a mix of organic shredded cheddar and monteray jack. Provolone cheese works great also! 2. Microwave for 1.5-3 minutes, or until the cheese is bubbly and starting to brown. The longer you wait. The crispier the shell will be, but it will burn if you wait too long. 3. When they come out of the oven I let them cool a few seconds and then I work quickly and gingerly (trying not to burn my fingers) and gently shape each shell around the rim of a large mixing bowl or in a taco stand. 4. These taco shells can be stored in an air tight container for 3-5 days. Remember, if you try this or any of my recipes, use the hashtag #eatyourselfskinny, #eatmoreweighless, and/or #thefittchick so I won’t miss it on Facebook, Instagram, or Twitter if you post a picture! How to Make Your New Year’s Intensions Stick!